Living on the coast and being exposed to the sun accelerates the aging process. You may see wrinkles; spots and sensitivities increase at the end of each summer season. We encourage you to set back the clock at the Summit. We offer a variety of skin care products and treatments to meet your individual goals. A chemical peel can remove age spots, soften or eliminate wrinkles, and have a shrink-wrap effect. If you want to treat sun damage or precancerous lesions, you may be a candidate for blue light therapy. We recommend that you start with a cosmetic consultation with one of our providers. There is no charge for this visit and it is a great way to gather information about your skin. Let us formulate a plan specifically for your skin type and goals. There is no substitution for experience and options. 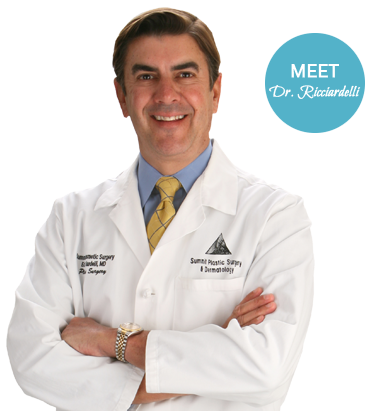 At the Summit you benefit from having dermatology, plastic surgery, and aesthetic skin care experts at your fingertips. Chemical peels use a medical grade solution to treat a number of skin conditions including, sun damage, uneven skin tone, fine lines, acne and acne scarring. This is a simple, non-surgical way to achieve a smooth, healthy glow. A chemical solution applied to the skin surface removes the out damaged layer to reveal new skin. During the healing process new collagen is generated. There are a variety of peels, formulations, and strengths that can be tailored to your needs. If you require a short recovery period without a lot of visible peeling, you might choose to have a light glycolic or salicylic acid peel. A medium depth peel, such as a VI peel, can target pigmentation in the epidermis as well as the top layer of the epidermis with a few days of visible peeling. Or you may choose a deep chemical peel such as trichloroacetic acid or blue peel for long-lasting dramatic results. What do I need to do before my chemical peel? At your consultation, our aesthetician will give you specific instructions for your chemical peel. Generally we ask you to discontinue Retin A containing products, stay out of the sun, and refrain from having any laser treatments prior to the peel. If you are having a deep chemical peel and you have pigmentation, you may be asked to start a regime of Retin A and hydroquinone for a 6 week interval up to 2 weeks before your peel. Feel free to bring a list of questions to your consultation. We love an informed patient. Our esthetician will let you know what to expect before, during and after your procedure and answer all of your questions. What can I expect during and after my chemical peel? Most patients tolerate light to medium peels easily. Frankly, the TCA or blue peel is uncomfortable at the time of the peel. Options for pain management will be discussed at your consultation. We want you to be comfortable. Most people are fine without medication but you do have that option. You will be given detailed instructions for your specific needs. Most patients do not complain of burning after a peel but a mild discomfort. On average, most patients are able to return to work immediately. Our door is always open for any questions. Why choose to have a chemical peel at Summit Plastic Surgery & Dermatology? It’s about confidence: confidence in your esthetician, confidence that your wishes and individual concerns will be heard, and confidence you will get the results you want. We have the experience and reputation that ensures your trusting your face to someone with a known track record and the proper certifications. Glycolic Peel: Easy-peezy peel with virtually no down time. Great for a refreshed look. Jessner Peel: Gentle peel that improves discoloration and blemishes, acne, fine wrinkles, and sun damage. We recommend that you have this peel about 4 times a year for maintenance.